Pitcher Josh Staumont works out during 2018 spring training. 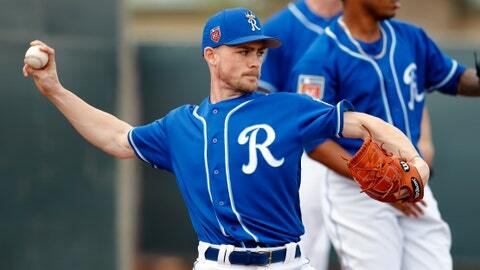 The Kansas City Royals have filled up their 40-man major league roster, adding three players ahead of Tuesday’s reserve list deadline. The Royals selected right-handers Arnaldo Hernandez and Josh Staumont from Triple-A Omaha and Scott Blewett from Double-A Northwest Arkansas. Blewett, 22, went 8-6 with a 4.79 ERA for Northwest Arkansas last season, ranking sixth in the Texas League in strikeouts (100) and third in starts (25). The Royals selected Blewett in the second round of the 2014 draft. Hernandez, 22, went a combined 12-5 with a 3.96 ERA for Omaha, Northwest Arkansas and Class A+ Wilmington in 2018. He signed with the Royals as a non-drafted free agent in 2012. Staumont, 24, had a 2-5 record with a save and a 3.51 ERA in 41 games for Omaha last season. A second-round pick by the Royals in the 2015, Staumont posted 103 strikeouts, tops among Pacific Coast League pitchers with six or fewer starts.